A 20-minute rain delay was not about the keep the Hillsborough Terriers from their quest for their first district championship since 2006. The rain began falling hard in the top of the third inning with the game knotted at one, and when the teams returned to the field, the Terriers’ bats came alive. Senior Tim Elko’s second RBI of the game drove in the go-ahead run in the bottom of the third and moments later, a two-RBI single from Antonio Jenkins broke things wide open. 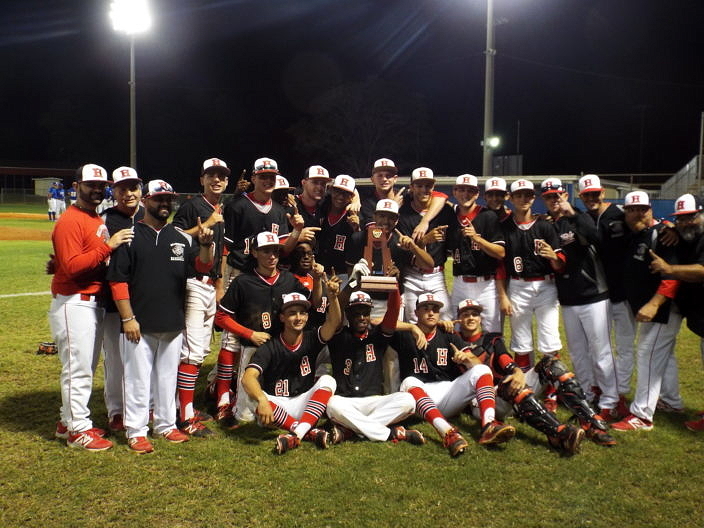 The Terriers tacked on three more runs and starting pitcher Jarrod Cande stymied the King Lions’ offense, as the Terriers cruised to a 7-2 victory over the Lions to clinch the 7A-8 championship Friday night. Addison Barger watches his fly ball land in foul territory as the Lions tried to rally late. 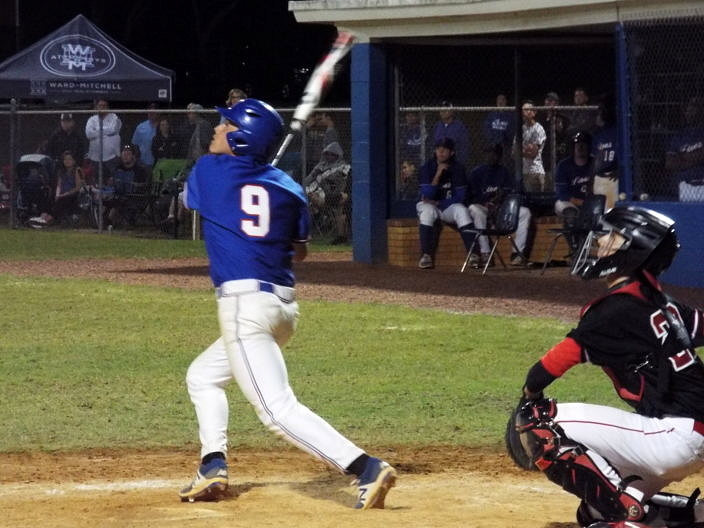 Five different players had a multi-hit game for the Terriers (20-4) who outhit the Lions 12-7 on the night. Ryan Romano, Quintin Graham, Jenkins, Cande and Elko all had two hits a piece, but it was Cande’s name that was all over the box score. Cande reached base three times with two hits, both doubles, and a walk, scoring three times to lead the Terriers. Cande also picked up the victory on the mound, allowing one run on five hits in four-and-a-third innings, striking out three batters. 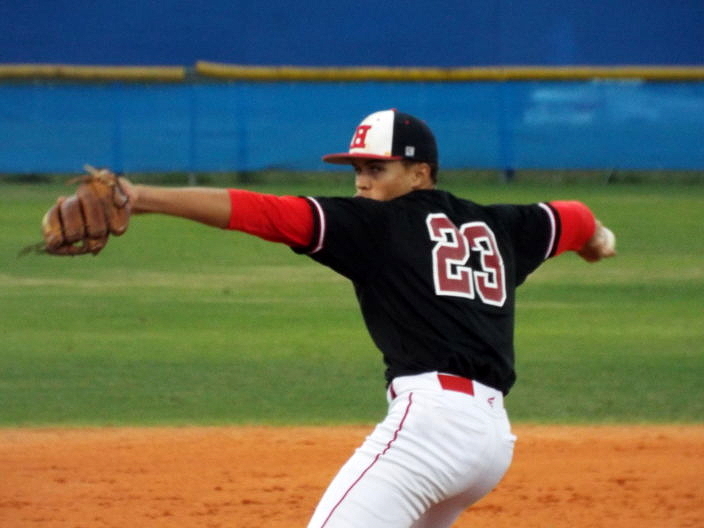 Cande was a ground-out machine as he relied on his defense to make every routine play, and they delivered. Cande was relieved in the fifth inning by Elko, who was perfect through one-and-two-thirds innings of work, striking out one in the process. Nick Romano was called upon for the final inning, and, despite allowing a run, he struck out two batters to lock down the victory for the Terriers. Jarrod Cande winds-up to deliver a pitch in the 7-2 victory Friday night. The rain delay could not have come at a worse time for the Lions (14-10), who tallied four of their five hits before Mother Nature interrupted. Back-to-back doubles to lead off the top of the third inning tied the game at one before the rain hit. After that, just two base runners reached the rest of the way for the Lions. Dehreon Pressley led the offense, going 3-for-4, and his double in the third briefly tied the game before the bats went quiet. Jamarcus Lyons, Zarrian Brinson, Bryce Pennington and Jaquez McIntyre all had a hit for King. Despite the tough defeat in the district championship, the season is not over for the Lions, who intend to regroup for the regional playoffs. Having been the leader of the dugout for over four decades, Coach Macaluso reminded his club that the bigger goal is still attainable.